In the latest years there is a shift in the tech industry towards mobile. Tech giants like Google and Apple are making mobile their first priority and acquiring patents to help them get the edge over the competition. We have seen many examples of small businesses that offer better mobile websites than their desktop counterparts but when big companies take actions to back these shifts, it is safe to say that this is future. But how exactly a small business can benefit from it? Lets see some stats. 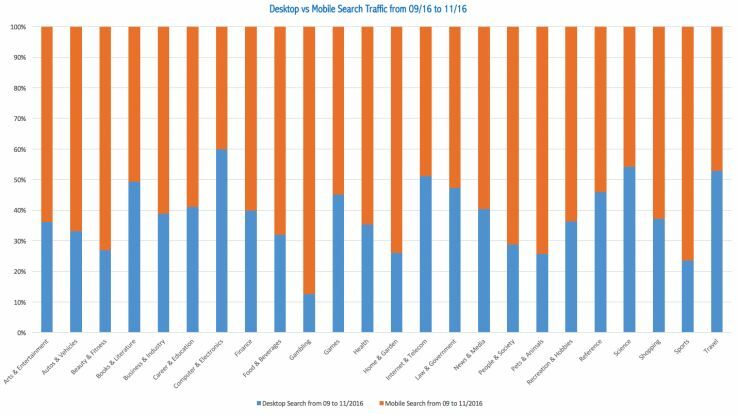 People are 60% more likely to visit your website through their mobile phones than using a desktop computer. The difference skyrockets to 90% for gambling websites and almost 80% for sports related sites. But the percentage of visits don’t always tell the full story. In 2016 72% of people use a smartphone and 75% a computer. As we can see in the graph above the mobile user’s percentage is going up. Optimize your site for the web. Responsive design is one way. You can also make a different site for mobile users. In the past the second option was so terrible that people abolished it after the original iphone came out but with a bit o practice it can be a better option. Small screens: Always remember that they have small screens and avoid the annoying popups. They don’t have time and patience for this. Nobody has. Be creative. They are on the go: Treat them as they are constantly moving because they probably are. Use as few of their MBs as possible when you load your website and get to the point fast. Its one of the biggest shifts in the internet history. For the first time internet is not designed to be used in big screen with keyboard and mouse, or a terminal, or even a laptop but for a device that fits in your pocket.